ndle another adaptation war and neither can I. In case you need it spelled out for you, that’s just rude. I understand that we all have favorite adaptations but the polite way to share your enthusiasm with others is by praising your film of choice, not by degrading other things. I’ll use the example of Caroline Bingley. She preferred the city custom of ladies not walking around unescorted or “long” distances. Instead of saying she preferred to keep the city custom even though she lived in the country, she criticized Elizabeth’s choices which were not improper, indecent or unlawful. It was simply a matter of taste. If you follow me on social media, you’ll see that I am now obsessed with making shareable cards. Finding a dearth of positive cards, I have made some for your viewing and sharing pleasure. I do not own the rights of the photographs in anyway and this is not meant to be self-promotion at all, just something for the fandom. Some are about the film, the book or just funny thoughts that capture the mood of the image. I hope you enjoy praising your film of choice! I made a Pinterest board with MANY more images on it and will update it as I continue to make more and include other adaptations. These are absolutely adorable. I love that you used other novels besides P&P. Keep them coming. I agree with you, Rose! I love the one with Frederick and his awesomeness! Thanks! They were fun to make. I love the Frederick one as well. No one else can light a room like Rupert Penry-Jones as Captain Wentworth! I have a whole Pinterest board with him (Rupert). Love him in MI-5. Have you seen it? P.S. I am also now following your board…I have a few of my own. Haha. Yes, I thought the faces really explained everything. Another favorite of mine is the sibling blabbing about the crush. I am a survivor of such atrocity and I am certain I had that look on my face. I love what you do with the memes and the above pictures. We each have our favorite adaptation and each has it’s good points as well as points where they stray from the original, even the BBC miniseries. 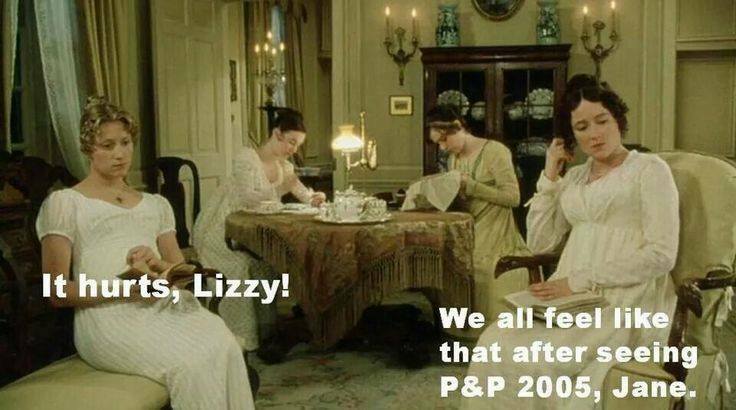 My favorite is the one that says, “What do you mean there’s such a thing as too much Austen?” Thank you so much for sharing. I’m glad you enjoyed them. On the Pinterest board there are more. I am hoping to have time to do more on the other adaptations I didn’t get to include here and then just more funny ones in general. Thanks! I definitely make that face when my reading device needs to charge. Emma handles the whole “I friend-zoned him for too long and now I’ve lost him to my best friend” thing way classier than I would have. Great memes! I simply have to learn how to make these. Do you use Photoshop? And I agree about getting along. Even though I follow a certain football team, I try never to post awful things about their biggest rival, for it causes animosity. I am for praising my team, not putting down the other. 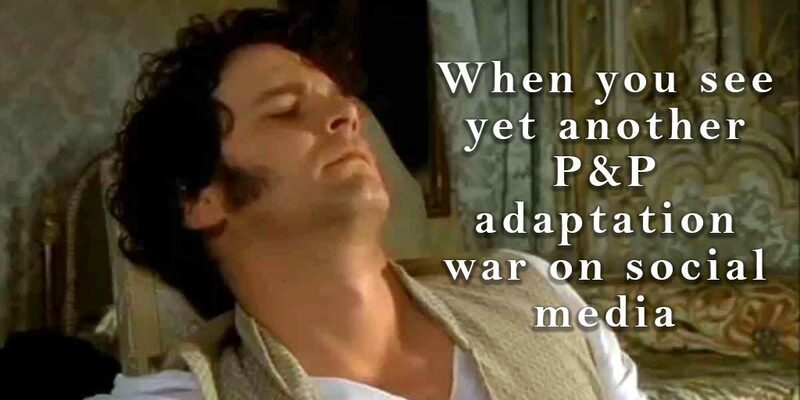 And that can apply to Jane Austen adaptations as well. Thanks! Yes, I use photoshop. I’ve got a basic Twitter and Facebook image size template. I found the dimensions online. Then once I have an image I like I copy the layer into the template and resize it accordingly. Then I usually keep it simple with black or white text, sometimes with an outer glow or drop shadow to make it pop against an image. The hard part is trying to come up with something witty to write. I always worry that no one will get my sense of humor! Hahaha, I do love that one. I asked my husband which one he liked and he chose that one too. It goes perfect with his ego. I don’t think Wentworth has a huge ego but I do here from Janeites how much they love Wentworth and Rupert Penry-Jones is definitely swoon-worthy in this adaptation. The other adaptations really get so little love. The Pinterest page is currently a bit unbalanced with P&P 2005 but there were a lot more readily accessible differing images when I searched for it in Google images. I haven’t even seen the 2008 S&S adaptation yet but I think I was able to make some nice memes for it. I really need to make time to view it! Kindness is free and it never hurts to give. Now, hopefully my mommy scolding posts are at an end. Love the cards, Rose! Thanks for making and sharing them. 🙂 Have an awesome day!